How is MSE working with Combinatorial Materials Science? Throughout history, scientists and engineers have relied on a slow trial and error process for materials discovery. Now some are using a relatively new technique called combinatorial materials synthesis. Also known as "combi," it allows for the rapid screening of a large number of compositionally varying samples to determine if any have the characteristics the researchers desire, saving tremendous amount of time and money in the process. The combi facilities at the University of Maryland represent only a handful of laboratories capable of this kind of work in the world, and are unique among American universities. In a combi thin film synthesis experiment, a laser is used to blast molecules away from blocks of raw materials, which are then deposited onto and then deposited onto a chip. Each area of the chip contains layers of different proportions of the materials that combine to form continuously varying formulae for new materials with new properties, each one just a little different from the next. A collection of these tiny samples housed on a chip is known as a combinatorial library. When one chip can contain as many different samples as scientists want, they can all be systematically and rapidly measured under the same conditions. Instead of allocating two years to create and test 100 samples one at a time, researchers can create 100 in a day and 100 more the next if they don't find what they're looking for. This "electronic nose" chip contains an array sensor devices that identify gasses through pattern recognition. This technology could be used to deter terrorism, monitor pollution, and measure air quality and safety. The sensors were created using combinatorial thin film deposition, which improves the behavior of materials by altering their composition. 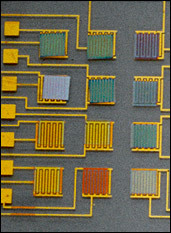 An example of a combinatorial library chip, part of a magnetic smart materials library. Each square has a sample made of different proportions of atoms and exhibits different physical properties. 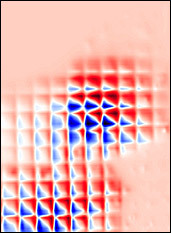 The pink areas of the library are regions in which no magnetic properties were detected in those particular samples.